The Web 2.0 Goldfish Bowl? Picture belongs to Michelle_Bower. Usual rules apply. In the past week, I’ve signed up to CoComment (manages my conversations online if I want it to), MediaStarz (pure networking, but hey – I was invited, and it looks like good fun) and finally Wink (to track what I’ve signed up to and where I am on t’internet). And it may yet get worse – what about WeFi? OrMyCyberTwin? Tempted to sign up to both of them, to be honest (especially the latter – closer to realising my dream of auto-blogging). And I’m just not sure where I stand on the ever increasing types of web 2.0 social networking. I do know that I can’t stop signing up to the blighters – if they look vaguely useful. I do worry about the overlap, to some extent. As ever, in times of need, I decided to visualise it. Trust me, when you click below, you’ll realise why it’s often a last resort. Needless to say, it explains in my mind how things are constantly changing, overlapping, and why. NB: I would suggest clicking on it and viewing it full size. But yes, this does link to Faris’s post a little earlier on continous partial presence (read the comments as well – they are excellent). The rate I’m going, there will be no more Will to spread around. At the moment, my Facebook is largely populated with my old mates, as opposed to my newer advertising/work friends (though the ad community is trying to usurp that – I think half the plannersphere who weren’t members of Facebook joined in the last month – and God knows, this article sheds a bit of light). And with the comparable measures some of these social networking sites are trying to implement (Technorati’s WTF being a prime example – it’s a wee bit like Digg), it may not be long before they are all linked together, as I’ve expressed in my Powerpoint slides. However, is this a bad thing? Certainly, more of my communities are mixing together than ever before – some ad folk now know some of my other mates, some are doing social stuff with me away from work, and some even go to the pub with me (poor them – even more rubbish talked). I met Helen for a very pleasant smoothie at Angel’s Breakfast Club, where we had a chat about (amongst other things) how people are different offline, to how they are online. Online, you feel you can get a sense of someone’s personality, only to meet them, and to be astounded about how introverted or extroverted they are. OR.. they can be precisely as you think. I like to think I do the latter, but eh, could be wrong. We concluded that the mystery is still there, a point I (sort of) alluded to in my post about thin-slicing people. You can meet someone on an off day, or in a new situation – and you never truly know how people will react unless you’re right there with them; and even then it’s not always completely clear. And yes, no amount of transferable identity could stop us reminiscing about that particular moment of blog history. But it got better (and this is material for a separate – long discussed – second part post about the Tate). Due to Lauren’s background, my uncultured arse got to learn a bit about art. And without my ‘Goldfish Bowl’, if that’s what it is, I would never, ever have been able to learn about some these things (short of paying people to tell me – which would never happen). If it does exist, it’s constantly shifting, and, inevitably, there will be crossovers. But to claim that my Facebook profile will always contain the same in jokes, in my limited experience either doesn’t matter, or won’t happen – social networks are for making friends, and whilst it does promote a bit of ‘us and them’ (those who participate, those who don’t), it allows interesting overlaps (just this week I met someone via Mediastarz who knew a mate of mine from University) and most importantly, new and interesting conversations. And if the mystery is lost, for the most part.. well.. I don’t agree completely. I like to think I’m always changing. You can’t ever know someone so well both online and offline that you can predict their every move. People continue to surprise you, and that’s great. 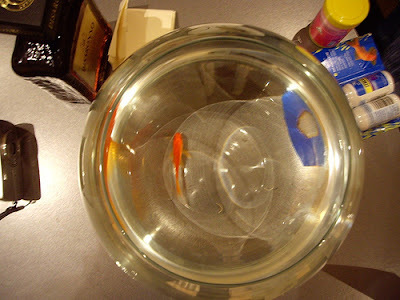 What do you think readers – is there a goldfish bowl in web 2.0? And is it a bad thing? And DO I look like Where’s Wally? ← WAM is One. Happy Birthday to me.. I liked your rendition (and am very envious of your guitar playing – I’d like to learn).I’ll embarass myself by singing at some point – but I have no Mac, so it’s not quite that easy to film myself (no, I don’t even have a web cam – no extra-curricular activities here. yes, will. you do look like where’s wally and i have the image to prove it. i didn’t upload it to flickr to save your dignity, but seeing as you brought it up…was ace to catch up again yesterday. good luck today. < HREF="http://www.flickr.com/photos/7299213@N03/514556703/" REL="nofollow">http://www.flickr.com/photos/7299213@N03/514556703/<>will masquerading as where’s wally..
At the moment I’m loveing the goldfish bowl. A chance twitter on Friday morning, led to Lauren and me meeting at the V&A later. It’s nice.Though on another day I may feel less enamoured! Helen – I was planning to come along to that, but the promise of a friend paying me back for all the meals he owed me got in the way.I will come along to one though.I like the web 2.0 scene, for the most part. I just don’t like the notion of being compartmentalised.I’m certainly not as against it as Charlie Brooker:http://www.guardian.co.uk/Columnists/Column/0,,2084333,00.htmlInteresting stuff.